Let the monster mash begin! 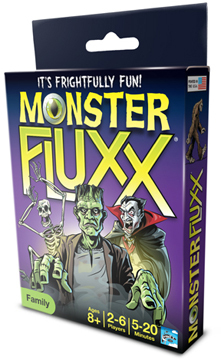 Classic monster movies and TV shows are the theme in this basic Fluxx deck. Despite the prominent monster presence, this deck is Creeper-free. Designed to introduce new players to the Fluxx system, it has just the four main card types and comes in a hang-tab style box.